Iceland sits on a mid-oceanic ridge between the North American and Eurasian tectonic plates and lies above a volcanic hot spot, which means it truly is the country of contrasts, where fire and ice have coexisted relatively harmoniously for eons. Where volcanoes and glaciers have, literally, shaped the geologic and human landscape. It’s also the land of the midnight sun, a place where long, lonely winters are countered by summer’s never-ending light. The Fjallabak Sydra, or Central Highlands, contains 80 percent of the country’s total area. It is part of the uninhabited interior of Iceland and among the very few such wild areas that’s relatively easily accessible left in the world. As far as the eye can see, the craggy lunar landscape is covered in kitty-litter-sized pumice in varying hues from black to brown. Purple patches of silene acaulis, or moss campion, tenaciously cling to the volcanic landscape in lowslung bunches. Non-native lupine, introduced to stabilize the loose soil, dot the sides of the road, as well as occasional bunches of thrift, which thrust long, pink globed stems toward the sky. The little flora that does exist creates a patchwork quilt of color that tells the story of a harsh existence in an unforgiving, but stunning landscape. And far off on the western horizon there was our first glacier, ghostly white, magically reflecting the summer sun and quietly keeping watch over us. The crew of 13 riders threw legs over our gravel steeds 10 miles back down the road, where the pavement ended, civilization disappeared and the magic of the Central Highlands began. 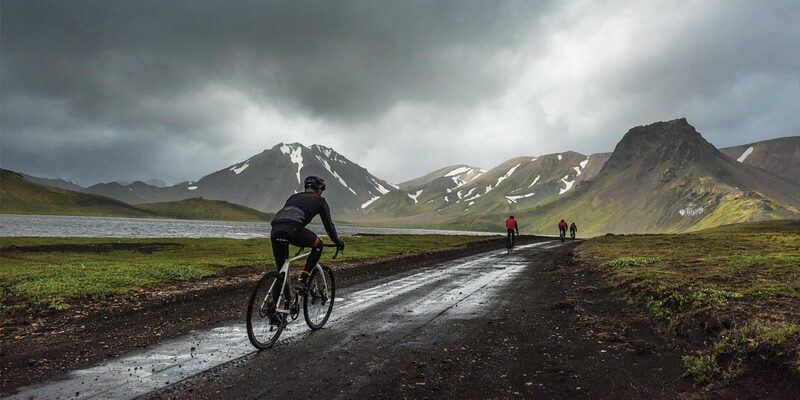 Of various backgrounds, from editors to race directors and racers to staff, we were summoned to Iceland by Lauf, the country’s iconic gravel bike and suspension fork company, as part of a product launch and recon ride (think future gravel race). 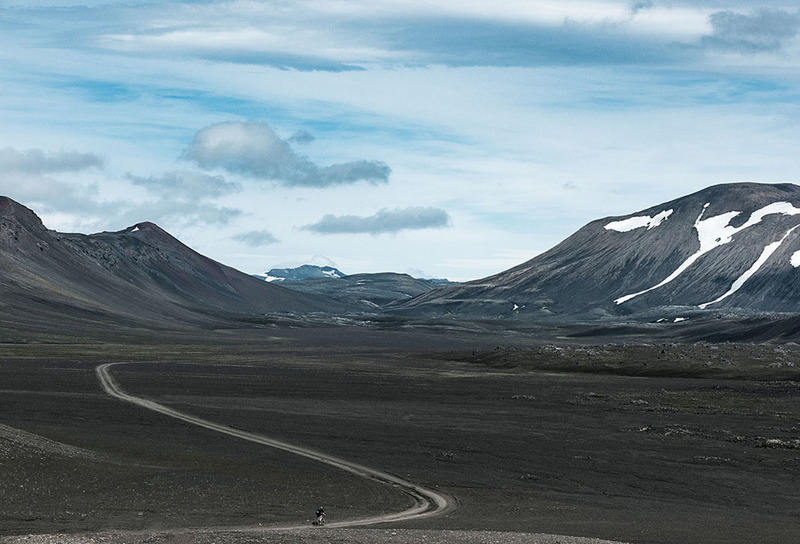 While ride details leading up to the trip were scarce, the thrill of going to Iceland for the first time erased most doubts that may have existed, but it still felt like we were stepping into the unknown. Speaking of the unknown, Iceland is a country where human isolation, long nights and extreme weather led locals to create the existence of elves. Meet Iceland’s huldufólk, elf/troll-like creatures that inhabit rocky places throughout the landscape—just like the one we were riding through. Icelandic author Ólína Thorvarðardóttir wrote: “Oral tales concerning Icelandic elves and trolls no doubt served as warning fables. They prevented many children from wandering away from human habitations, taught Iceland’s topographical history, and instilled fear and respect for the harsh powers of nature.” And, according to Icelandic folk beliefs, one should never throw stones because of the possibility of hitting the huldufólk. Check. No rock throwing. Only bike riding. The last thing I needed to do was anger some huldufólk. 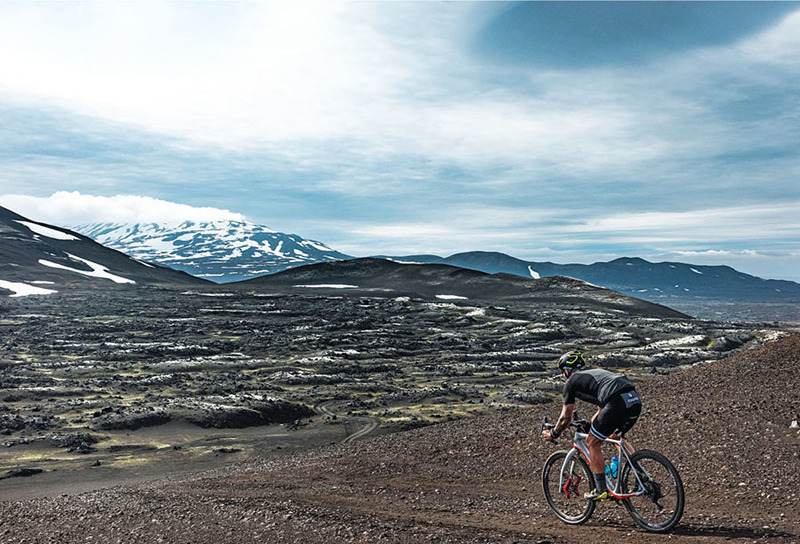 NASA came here, to the Central Highlands, when it conducted much of its lunar-landing training—which might explain why I felt like I was riding on the moon as I navigated the undulating gravel road that fanned out before me. It was hard to focus on the riding when I was so distracted by the stark beauty of my surroundings. After about 25 miles, like magic, two tents appeared in the distance, nestled at the base of a snow-patched scree field. The smell of hotdogs on the grill and promise of cold beer lured us the final mile to our lunchtime oasis. After a river crossing and a scenic-valley pedal with milliondollar views, our day ended at Landmannahellir Cottages, eight mountain cabins set conveniently at the foot of the Hellisfjall mountain. We quickly changed, crammed our luggage into one of the long houses and piled the crew into cars so we could visit Landmannalaugar, an area known for its geothermal hot springs and mind-bendingly beautiful vistas. The main hot springs, which was teeming with people of all nationalities, sits in a flat gravel plain between a glacial river and an ancient lava flow. If you didn’t know better, you’d think you were hot tubbing on Mars. But, unlike the red planet, Iceland’s landscape is sprinkled with an otherworldly palette of colors. In elementary school I remember using the mantra “Iceland is green, Greenland is ice” to help me distinguish between the two nearby countries. Turns out the history behind this naming snafu is complicated, but one of the most commonly held pieces of lore in regard to Greenland is that 10th century explorer Erik the Red knew that if he named a place “ice land” it would sound unappealing and wouldn’t attract new settlers. So he called it Greenland to enhance its appeal. Consider it one of the earliest examples of bad/good PR. And Iceland? Well, there’s the myth that when war broke out among Norwegian Vikings, a band fled to a green land. Afraid that their enemies might follow, they sent back word to Norway that their land was covered in ice but there was another island, not far off, that was green. A classic example of false advertising. But the true story of Iceland’s naming, according to most historians, has more to do with Ingólfur Arnarson, a Norse chieftain who founded Reykjavik in 874 and is generally credited with coining the name after seeing an inlet jammed with icebergs. Talk about false advertising—but let’s talk about the weather we woke up to on Day 2 of our adventure. I was under the impression that it was “summer” in Iceland, so the cold, stinging rain that was pecking viciously at my exposed cheeks was an unpleasant surprise. The 39-degree temperature that bit at my clothes, trying to get to my skin? Well, that didn’t feel like summer either. And the 50- to 60-mph winds, the ones that were blowing folks off their bikes and others off the road? The ones that were giving any exposed skin a good sand blasting, an exfoliation if you will, of micro-sized pumice? Those sure didn’t feel like summer! Now throw in 15-plus river crossings, all of which were calf deep or higher, and you have the perfect storm for an epic beat down—and prime conditions to get a solid case of hypothermia. 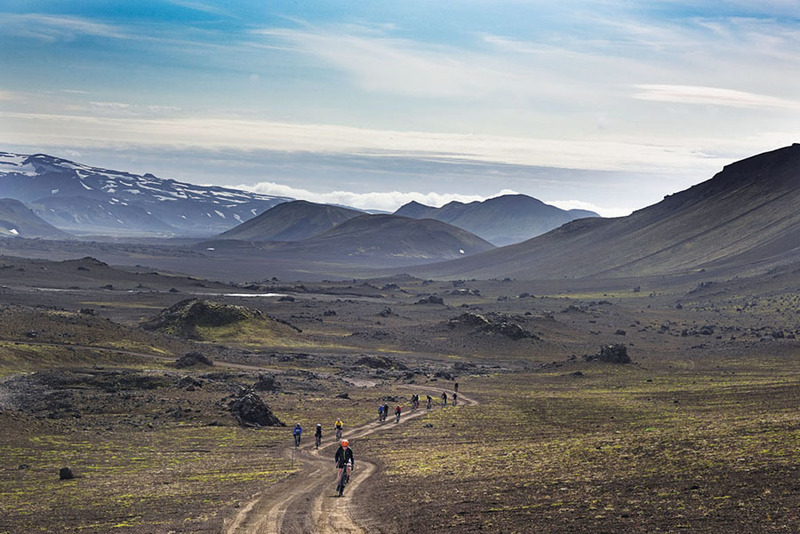 I’m not sure what the Icelandic word for “Bamf” is, but I’m confident it would include a picture of Benedikt Skulason, one of the founders of Lauf Cycling, and the only person tough enough to soldier through the horrific conditions and ride the entire 37-mile death march, alone. The rest of us got in a vehicle at some point. All of us were battered by the conditions. What he did was legend and will forever be etched in Lauf lore. It was ironically fitting that our final resting spot, Skaelingar Hut, was an old cabin used by farmers gathering their sheep from the highlands. Perched on a knoll and surrounded by an electric-green sea of moss-covered lava, the A-framed wooden structure with traditional Icelandic walls of stone was actually smaller than it appeared, much smaller. And when our cold, shivering wet bodies were crammed in the bunks that lined two sides of the hut, it was quite claustrophobic. Add to that five or six cases of beer, some brown liquor, warm soup and Snickers bars, and you have the ingredients for an Icelandic frat party. There are some words that don’t get lost in translation, so when the park ranger dejectedly hung her head and exhaled an exasperated “f—k,” I knew we might be in some serious trouble. The deluge that had pummeled the region for the past 24 hours unleashed major flooding that we weren’t aware of. Enough rain had fallen to force an emergency closure of Vatnajökull National Park. In fact, the ranger had just come from rescuing two cars stuck in river crossings, so the last thing she wanted to hear was that there were 15 people, three cars and a fleet of brand new bikes stranded on a sandbar in the middle of a rising river. Obviously, the logical thing to do in her case was to drop the universally understood F-bomb. Go figure: It was Benedikt’s dad “Skully” who had a truck tall/tough enough to get across the rising river. He became the soggy savior and drove bodies, gear and bikes across the raging waters, while the park ranger ferried people to a heated hut about 5 kilometers down the road. It took five trips across the river; the last time the raging torrent nearly crested the hood of his truck. (Not long after that crossing, the water caused Skully’s electrical panel to short out.) Once we were all secure and safe, frantic calls were made to friends/family in Reykjavik and an evacuation plan was commenced. And so, post extraction, from the warmth and security of an artistic coffee shop in downtown Reykjavik, I was able to reflect on our few days of adventure riding in the Fjallabak Sydra. Was it a place I would want to race my gravel bike? Was it a place I would dream of returning to, in search of more color, more trails and more sunshine? Was it the next best thing, the newest sweet adventure destination, the oddest landscape I had pedaled through? Would I be lucky enough to spot some elusive huldufólk if I came back again next year? In just two days we experienced the fierce contrasts of weather in Iceland, just one example of the juxtapositions this magical land brings together. We’d explored some of the most stunning gravel roads in a very stark and austere lunar landscape. We’d pedaled past turquoise crater lakes with colorful names like Frostastadavatn and Lifrarfjallavatn. We’d crossed countless glacial rivers that coldly clawed at our legs but reminded us how alive we were. We’d made firm friends through our shared suffering and adventure. 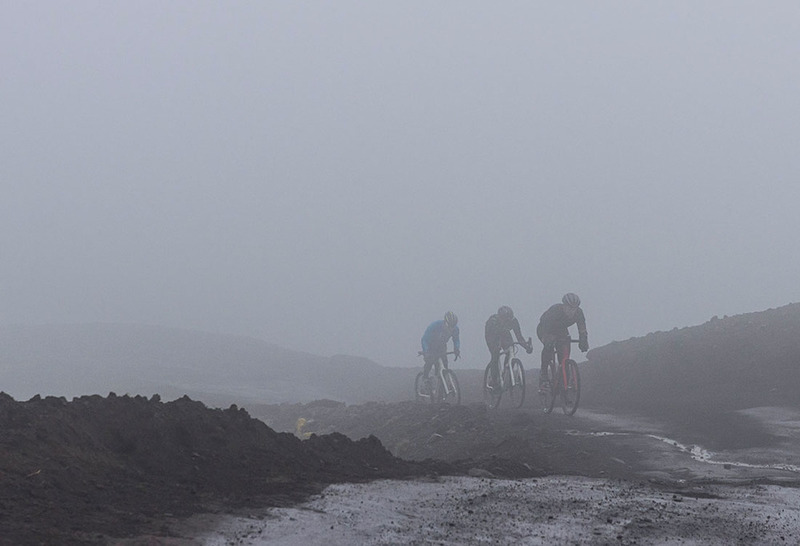 We’d felt the sting of Iceland’s “summer” weather. Despite the challenges, Iceland had found a way to burrow deeply into our hearts. And the whole time, the glacier was keeping watch over us.